This is the first of two unique two-bedroom apartments located on the first floor of this beautifully restored 16th Century Renaissance flat with a private lift. The living room is spacious and furnished with originality and style. Restored wooden beams in the living room, ornately painted and true to the original, parquet floors, 10 foot ceilings, carefully restored trim and windows everywhere provide a light and airy sense of comfort on a very quiet street close to shopping, transportation and the finest restaurants. This is Prague’s most prestigious area, Mala Strana. A beautifully reconstructed flat in a 16th century building, the flat is just a wonderful few minutes walk to some of the most interesting sites in Prague, including, the Castle and The Charles Bridge. Cobblestoned, gaslight, winding streets will charm you. The flat is entered either through hall door, 600 year-old spiral sand stone steps, or a private lift. Two beautifully reconstructed Apartments in a 16th century building, both Apartments are just a wonderful few minutes walk to some of the most interesting sites in Prague, including, the Castle and The Charles Bridge. Cobblestoned, gaslight, winding streets will charm you. Both Apartments are entered either through hall door, 600 year-old spiral sand stone steps, or a private lift. Deep-set windows, thick walls contribute to the ancient romance of this flat in the most prestigious area of Prague, Mala Strana. The views from the bedrooms and the living rooms are breathtaking as this building sits on the river both the bedrooms are tranquil and quiet. The building is completely reconstructed and this Renaissance Apartments offers a modern bath and kitchen with all modern conveniences. Activities: Prague has everything for the perfect city break. Prague abounds in Theatre, clubs, casinos, opera, ballet, concerts & discos. There is something here for everyone. Having been spared damage in WWII and then occupied by the Communists for 40 years (who did absolutely nothing), Prague remains that untouched jewel from the past. With the largest historic centre in Europe, Prague invites you to walk down one cobbled street after another. The history and architecture will fascinate you. The living rooms are extremely large and spacious and both Apartments are decorated with a combination of restored antique and vintage furnishings. Thought care and originality in the décor, serve to create an atmosphere of class and elegance which we believe, will help make this properties one of the most popular of our five Prague Apartments (93243 811627 97558). The views from the bedrooms and the living rooms are breathtaking as this building sits on the Vltava river both the bedrooms are tranquil and quiet. The building is completely reconstructed and this Renaissance Apartments offers a modern bath and kitchen with all modern conveniences. The building is located on a very quiet street close to shopping, transportation and the finest restaurants in Prague’s most prestigious area, Mala Strana. This is a truly unique location with front side views of the Charles Bridge and back side views of the Castle. Of our six apartments (97558 ,93243,1980948, 811627) which are all rented successfully both these properties are by far our most popular and have never ceased to wow and impress our guests. You simply cannot find a better location in Prague. The front side views of the Charles Bridge and back side views of the Castle are breath-taking and will give you an experience unmatched by any other Prague apartment. toilet, tub, shower, Separate bath and shower corner. Dinning are next to Kitchen with comfortable sitting for 6 people. Really super apartment and an amazing city. We feel so fortunate to have found this apartment! My husband, daughter and son-in-law spent 3 nights here but longed for more. The photos represent the rooms accurately, the space was clean and well appointed, and Ilan was waiting for us just as promised. The BEST thing is the location. Having never been to Prague, we didn't know that we'd landed in the ideal location. The neighborhood is lively but the apartment was not noisy. We walked everywhere -- across the Charles Bridge, to Prague Castle, to restaurants and shops. And we thoroughly enjoyed walking along the river to breakfast on a sunny, spring morning. Since we were only staying for 3 nights, we didn't do any major cooking but the kitchen appeared to be well equipped. We wished for some staples such as milk or eggs or bread -- and maybe if we were staying longer that would have been provided -- but that was our only unfulfilled wish. The booking process was stress-free and Veronika and Ilan answered every question we had in a timely manner. They gave us good tips about arriving at the train station and taxi service, as well as nearby restaurants. When a fuse blew, we called Ilan to leave a message and he actually picked up the phone and told us how to fix it. We've rented homes all over the world and that is not a given. We all felt totally safe and well cared for. Everyone agreed we would rent this exact apartment again without hesitation! 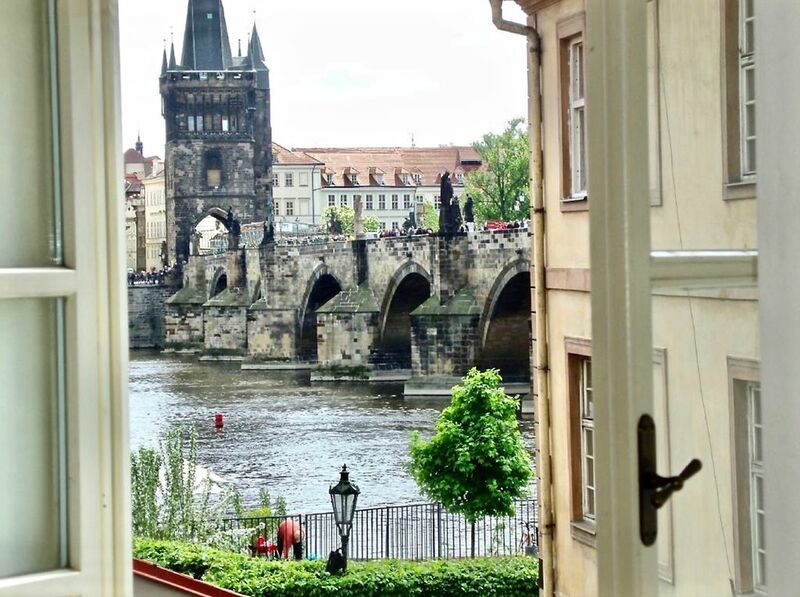 Our experience in Prague with this wonderful apartment was outstanding. There is plenty of room, it very clean and the location could have not been more perfect. We had a lovely time. Owner extremely responsive to any and all questions/concerns. Apartment well equipped for all of our needs. Elevator perfect for my mobility issues. Washer dryer great for our month long trip to Praha and other cities. Loved sitting in the window and watching all the tours go by. Or the swans in the canal. Hoping to go back again some day. Beautifully reconstructed two bedroom apartment in Mala Strana, the oldest quarter of Prague. Walk to everything. The area abounds in the finest restaurants, and shopping. Just around the corner from a transportation hub, you are within minutes of everything in Prague on the inexpensive, fast and clean public transportation system.